The quote above is one I have referred to often when asked why I decided to become a doula. The answer to me, is so simple… because every birthing woman deserves to be heard. The most basic thing our health care system can do is listen to their patients and respect their choices. Unfortunately, most birthing women and their families are presented with a one size fits all, policy driven environment with little room for “personal preference” Most do not even realize that they have choices when it comes to birthing. Or worse, that having choices matters. Let me explain. Childbirth is in every way for every person involved emotionally, mentally, physically and spiritually transformative. In fact, the ability of the cervix to soften and open directly corresponds to the mental state of the birthing woman. In addition to this, it often also corresponds to the level of pain and discomfort. This means that in order for your body to complete the process of birth, it must feel comfortable and safe. In other words, to be able to birth… you must believe you can. And if you do not, you set yourself up for an experience that is fear filled and disempowering. It follows that if your mind and body are so deeply connected, the idea of failure and brokenness has the ability to affect postpartum as well. The first moment you meet your child, then, should be fearless and strengthening. It should send you into motherhood with confidence, knowing that you are capable and competent. How do we accomplish this? Non-medical support that fills the cultural gap! Why can’t my partner/mom/midwife be my doula? While having your partner, family or other friends present can be helpful, it is difficult for them to effectively advocate for your wishes in such an emotional environment. On top of this, they may simply be unfamiliar with the birth process, which limits their ability to understand what is happening and how to best support you. Our nurses and midwives, though well versed in the birth process, are primarily focused on your physical well being and must put that need above all else. In a hospital situation, they may also have other patients to care for, limiting them even further. The modern Doula, then, is essentially the missing piece of the puzzle. 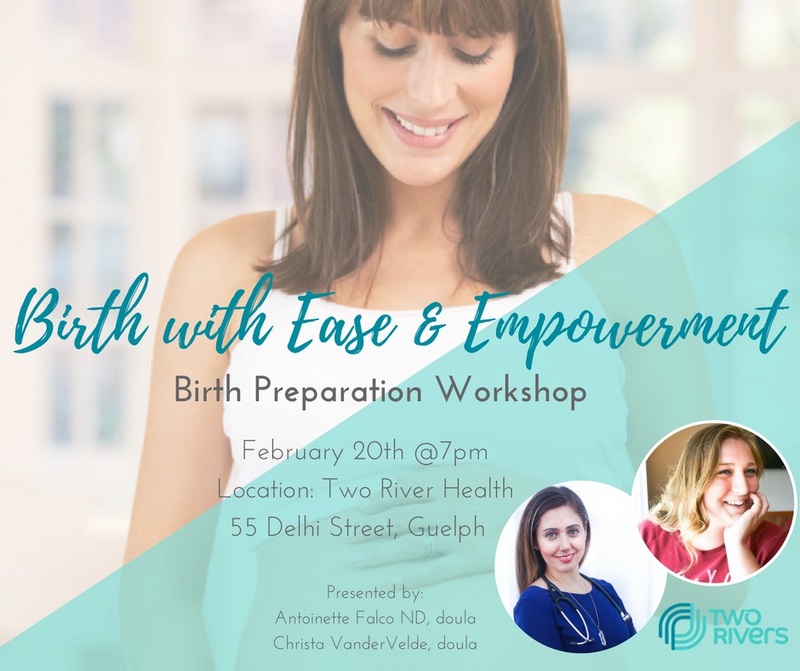 Doulas Christa VanderVelde and Antoinette Falco have a deep passion for educating, empowering and supporting the birthing women of Guelph. Our desire is that every woman would know the strength of her own body. That birth would be a life altering, strengthening experience. Come out on February 20th to a FREE birth preparation workshop at Two Rivers Health. This unique 90-minute session will feature information and advice on how to birth with ease and empowerment by taking charge of your own birth story. Space is limited! Please RSVP here to reserve your spot. What Does a Holistic Nutritionist Do?